When a customer calls our Limousine Service for transportation for children, they can be certain that they are getting the best possible service for their money. We have booster seats (which are required by law) for children, and will provide them upon request. The first thing to think about when calling a limousine service for children is the child's safety. Our limo service makes sure that all precautions are taken with our cars and limo chauffeurs to ensure the best and safest ride for your child. Booster seats come in front facing, back facing, and infant car seats. 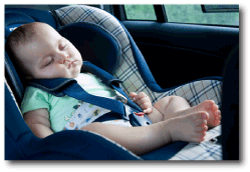 A child under one year of age and 20 pounds must sit in a back seat rear-facing chair. By law, all children under eight years of age must be fastened in a booster seat while driving. Our company can provide this safety measure or you may bring your own booster seat. Our professional limo chauffeurs are well-versed in the matter of Booster Seats, and you can depend on their help fastening the seat securely. If the child is fussy and may not want to sit in the seat provided by the company, feel free to bring the usual booster seat that the child is used to in his/her own car. 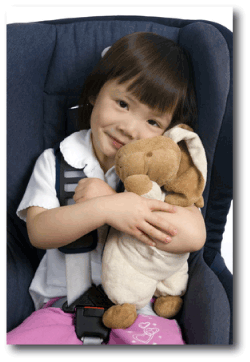 This can save tears and time, and we want all the children we transport to feel at ease. You can be sure of a smooth ride for your child in one of our new, modern, limos. Our chauffeurs are all licensed drivers who have passed many tests before being certified. They understand how to deal with children and are gentle and kind in their approach. Many families go on vacation together, making it necessary to have transportation to the airport. When children are involved our licensed and professional drivers will see to the child's safety and comfort first. Booster seats are always used with children of various ages, and the customer may choose to bring the one used at home or use one of ours. The transporting of children always makes a parent nervous with all the 'what ifs'...we try our best to put the parents' minds at ease by explaining how the work and by showing the features of each seat. Your child will travel in comfort and safety when you choose our service and you will have a stress-free ride as well. For many years children rode in cars without any restraints at all. This made them vulnerable to accidents and mishaps. In the past several years we have become more safety-conscious and our children are more protected. Our service, with booster seats, is the perfect answer to your travel needs.